As populations migrate to city centers and sustainability has hit the mainstream, the demand for fresh, affordable and readily available produce in urban areas continues to grow. In response to this dual shift in the American mind-set, innovative ways to produce and distribute food closer to consumers are cropping up in cities across the country and around the world. Urban gardens are greening empty lots, not only providing local residents with fresh fruits and vegetables, but also creating jobs and the opportunity to learn new skills. Rooftop greenhouses are emerging as an efficient way to maximize freshness, while minimizing the carbon footprint of produce transportation costs. Local farmer’s markets are also gaining popularity, offering city-dwellers better tasting produce with greater nutritional value. Buying local just makes good sense, both economically and ecologically. Great idea. Why didn’t we think of it sooner, right? Well, in Cleveland, this idea is hardly new. In fact, the West Side Market has been providing the city and its surrounding suburbs with affordable, locally grown food for over 100 years. 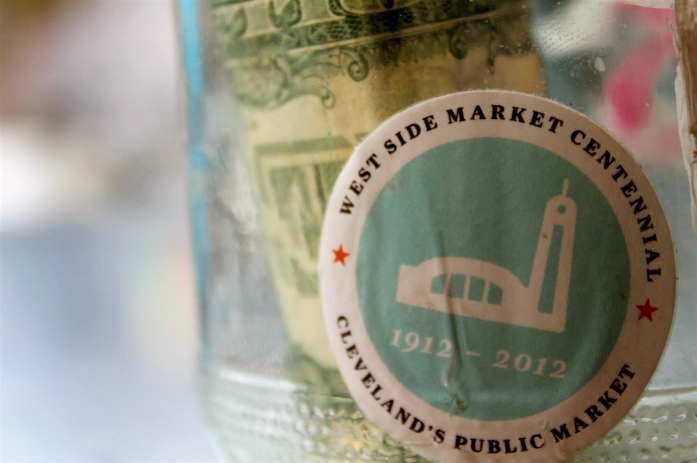 The West Side Market, Cleveland’s oldest publicly owned market, has been a one-stop grocery shopping experience for Clevelander’s and tourists for over a hundred years. Located on the corner of West 25th and Lorain Road in what is known as Ohio City, this market contains everything from fresh meat to local seafood, fruits, vegetables, candy, bread and much more. It is a hub for Cleveland businesses and possesses an abundance of rich culture and heritage. 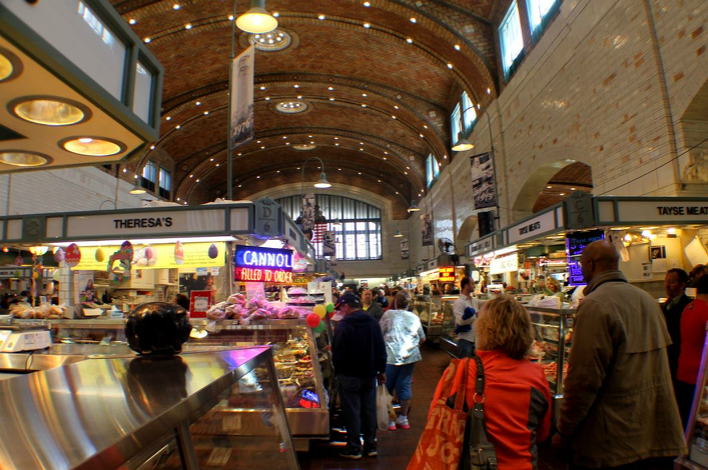 Whether it is tourists from out of town or people who have lived in Cleveland their entire lives, the West Side Market is a bustling place to get groceries or grab lunch. The market has been recognized by the Travel Channel and Food Network for its unique market-shopping experiences and ethnic food selection. In the market’s centennial year, it was estimated to have had close to a million shoppers come through its doors. The West Side Market is open on Monday, Wednesday, Friday and Saturday and offers the true feel of market shopping. Anthony Sudano, a local Cleveland resident states, “I come to the market a few Saturday’s out of the year to get fruits and vegetables. It’s a great opportunity to buy locally and spend the day with friends and family.” During the week, the usual shoppers who return to buy their weekly groceries take advantage of smaller crowds and better parking, whereas a Saturday shopping experience can be crowded with people wanting to grab lunch before an Indian’s game or spend their day in the city. The Market is essentially funded through each business and organized by the Market’s office. Each vendor pays for their spot, inside or outside the Market, and the cost varies on the size of their stand. 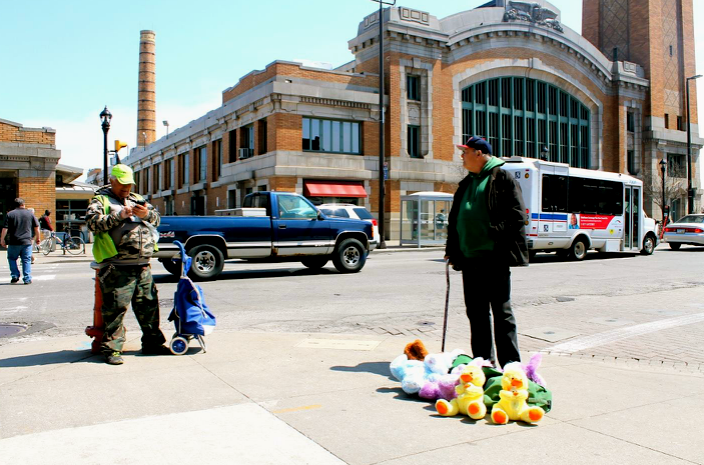 “A little help from the homeless”, are words that can be heard shouted outside the West Side Market by a homeless man named Raymond Jacobs and other homeless people living in the Cleveland area. Jacobs, a Cleveland “resident of the streets” can be seen and heard selling newspapers in order to raise money for himself and other homeless people living on the streets of Cleveland. But this newspaper, unlike The Plain Dealer or Sun Newspaper is completely composed of articles and columns written by homeless people. “We stand outside the market here because we know it’s a place that Clevelander’s come every week to buy their food”, says Jacobs. “We want shoppers to know we’re doing something to get donations from people instead of just begging.” This newspaper called “Cleveland Street Chronicle” has been around for more than 20 years. What started out as photo flyers and stories of the lives of each homeless person, turned into a small newspaper filled with stories of all local Clevelanders. Jacobs stated that to write for the paper, contributors must be drug and alcohol free, an incentive that the money earned from the paper would only be used for necessities such as food or clothes. 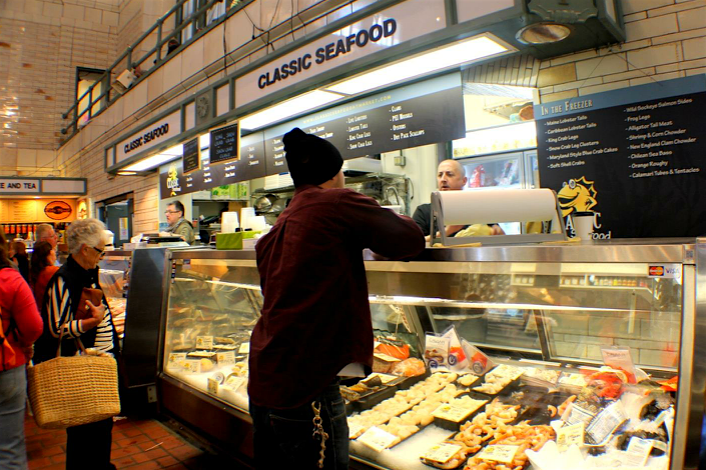 The West Side Market, being around for more than a hundred years, has become many Clevelander’s source of livelihood, fresh food, and civic pride. John Busch, 82 years old and born just down the street from the market on Franklin Avenue, has been buying his groceries from the market for 65 years. Busch said that his favorite stand in the market is Foster’s Meats, the stand pictured to the right. “Honestly, they are all my favorite”, said Busch. 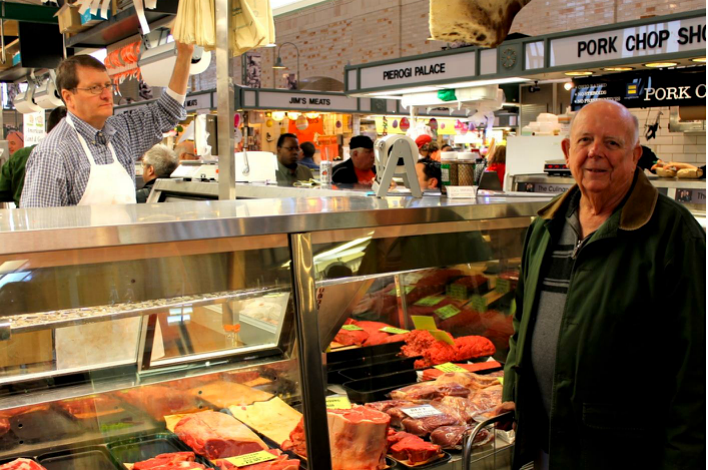 “The market has everything I need from meat to cheese, chicken, steak, and vegetables. The best part is that I know my food will be fresh.” Many West Side Market shoppers like Busch return to the market each week to buy food for their families because of the freshness of the produce and to support local Cleveland businesses. I want to thank Sarah for allowing me to use her photo essay on Teach Green. I appreciate her power of the pen and keen eye for human interest stories. We hope to work together more often in the future. In a speech on November 13, 1974 (40 years ago) at a meeting of the Organisation for Economic Co-operation and Development in Paris, Moses Henry Cass, the Australian Minister for the Environment and Conservation cautioned, “We do not inherit the Earth from our ancestors; we borrow it from our children.” It is up to us to teach them how to take care of it. I believe that providing them with a place to test their ideas and find their voice is a step in the right direction.